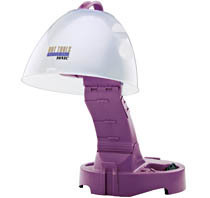 Professional Hard Hat Anti-Static Ion Dryer - 1875 watts. Ion Technology for faster drying, increased softness and shine. Helps reduce frizz. Folds for compact storage. Large bonnet size accomaodates all roller sizes. Extra large vents for increased air flow. 2 speeds 2 heats.